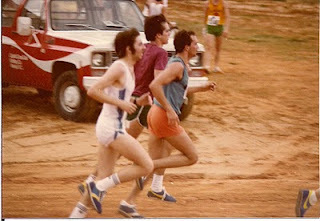 Well, I'm looking forward to 2010 but thought I would share a picture from the 1979 Great Raleigh Road Race 10k. As I shared in my last post, the training is going very well and I am hoping to build on that and hopefully it will lead to some good performances in the upcoming races. So here is the plan. I will start off the year with the Resolution Run 5k on New Years Day. This is not a fast course so I don't expect an impressive time but hopefully I can put in a strong effort and use it as a good workout and have some fun in the process. A week later on the 9th I will be running my 6th Salem Lakeshore Frosty Fifty K. As always there will be lots of my ultra friends and a few making the move into the ultraworld. I will be attempting a new 50K pr and feel confident I have a good shot at it. I'll be returning once again to Myrtle Beach but for the 1st time I will be racing the Half-Marathon and not the full. With my new plan for Boston qualifying it made sense to run the half here as a test and strong workout. And the reason I'm just running the half at Myrtle is because I have decided to go for my Boston qualifier at the new Tobacco Road Marathon on March 21st. This should be a fast course with most of the course on the American Tobacco Trail, a converted rail trail in the Cary-Apex area. The following weekend will be a return to the Umstead 100 miler but not as a runner but as a volunteer and pacer once again. No set plans for now but possibly a 5k or 10k. Thinking about returning to Asheboro and doing the 5k there that I haven't been to in about 10 years. A fun local race and afterwards spend the day at the Zoo. Looks like Karla and I will be running the Flying Pig Marathon in Cincinatti for the fun of it. What kind of pace will depend on how the Tobacco Road qualifying attempt goes. Our friends Lisa and Jerry may also be going and Frank will be running the half with one of his high school friends. It's back to the ultra's again with a return to the Bethel Hill Moonlight Boogie 50 miler. I dropped out after just 10 miles in pain in 2008 and I look forward to going back healthy and I hope to attempt a 50 mile PR. I'm looking forward to return to one of my favorites, the Grandfather Mountain Marathon. I may have something special planned for this year. Stay tuned this summer. If possible I may also return for some fun at Catherine's FA 50k and visit with my VHTRC friends. Other than that I'm not really sure what the last 5 months may bring but whatever it will be FUN !! You are one driven guy! I have no doubt you'll qualify for Boston in 2010! Good luck with your other PR goals! You inspire me!